The Nepean Times announced in May 1892 that Mr Thornton of Sydney had commenced the erection of a commodious wood cottage on the main road and just a little west of the station. The cottage was called 'Lorna Doone' and Edmund ran it as a guesthouse. George Stratton caused Mr Thornton some grief in January 1893 when he broke pot plants and threw a fence rail at one of the cottage windows. Edmund and his brother Charles caught Stratton after a chase of half a mile and Stratton was later charged with the crime. In 1893 Edmund took over the position as the pound keeper after Mr Stace resigned. He involved himself in the dealings of the growing township and in April 1893 moved that a Progress Association be formed in place of the current Progress Committee. The suggestion met with success and Mr G. Larsen seconded his motion. A committee was formed in June following a suggestion from Edmund regarding possible sites and costs for the erection of a Public Hall. They were to report to the next meeting of the Progress Association. The committee comprised of Messrs C. Lees, J. Tanner, Mr Honeysett and officers of the association. Controversy arose in July 1893 after a long and animated debate about the proposed public hall. The Hon. Charles Moore had offered a suitable site if money was forthcoming or could be raised to build it. Edmund was somehow blamed for not supplying more details and the matter had to be adjourned. Edmund assisted at a benefit concert given to aid the Coyle family through their loss in 1893, acting as an accompanist. Later, in August 1893, he had a serious horse and buggy accident. The Progress Association resolved in November 1893 to send Edmund and Mr A. Ferguson to a meeting at Lawson for the combined Mountain Delegate Association of which Mr G. Larsen had nothing but praise. In a complete turn about - that resulted in the resignation of Edmund from the Springwood Progress Association - Larsen wanted the matter adjourned to a later meeting, when they came back with the result. Larsen said he could not see what benefit the Mountain Delegate Association could be to Springwood and moved that the secretary write back declining their offer. Edmund said that if Larsen’s motion was supported he would resign. Mr Baxter junior seconded Mr Larsen’s motion, it was passed and so Edmund resigned on the spot. 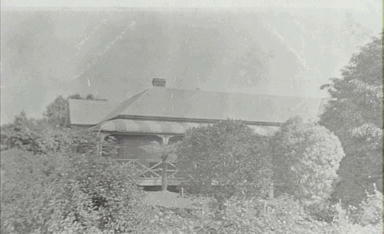 Edmund became discouraged early in February 1894 because of the poor patronage of his guesthouse and decided to let the cottage to Mr De Lissa of Sydney who was a photographer. 'Lorna Doone' was let to the De Lissa family for one year. Edmund married Margaret Thurston in 1891 and his brother Charles married her sister Roberta. Edmund and Charles were two of several children born to Monaro Pioneer Henry Thornton and wife Sarah (nee Mitchell).